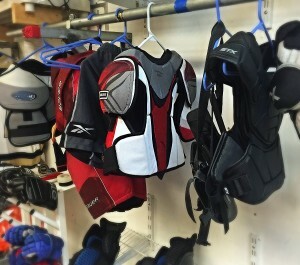 Wondering how our unique process of washing hockey equipment works? Well, take a step-by-step tour of how your equipment goes from smelly to clean - in 48 hours or less. Each item to be cleaned is inspected by the HLS and placed in the collection bag. Every item is accounted for on the Hockey Wash claim check sheet and any damaged items are noted you will get a receipt. 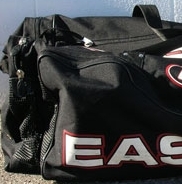 The equipment is removed from the collection bag and placed in a custom mesh washing bag. The wash-proof bag tag is also inserted into the mesh bag to correctly identify your equipment. 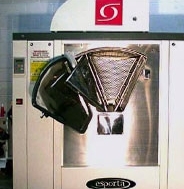 The mesh wash bag containing your equipment and bag tag is inserted into one of the eight individual compartments of the Esporta 3200 washer-dryer system (the world's first commercial machine capable of cleaning heavy sports equipment and protective wear without causing damage to the equipment). Each set of equipment gets its own secure compartment. In a 20-stage process that spans three hours, the Esporta 3200 machine washes, sanitizes, and dries the equipment contained in its eight compartments. The machine gently rotates the equipment through the water and releases special cleaning agents that both clean and deodorize the equipment, effectively killing 99.9% of bacteria. When the washing and sanitizing cycles are complete, the machine extracts the water and begins the drying cycle. Upon completion of the internal drying cycle, the equipment is removed from the washing machine and remains in the mesh bag for the external drying process. Electric fans also remove any residual moisture. All that remains is for you to present your claim check, pay, and your newly cleaned equipment is ready to go!